Count 1-99 screws according to the different quantity of screws that the work needs to lock. After locking the last screw, the buzzer gives a sound to prevent missing out and notify the end. Each time after finish a work piece, the counter will be auto reset and immediately ready for next turn of operation. (Do not count for the second repeated locking operation of a same screw in a short period of time). It can adjust time judge according to the degree of difficulty of screw operation. 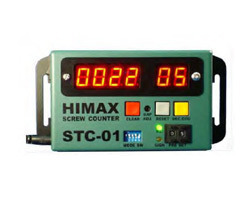 Prevent error counting and more other functions, convenient and practical.